Less than an hour away from Las Vegas is the Hoover Dam. Built during the Great Depression, this impressive engineering marvel spans approximately 245 square miles of surface area. It took 3.25 million yards of concrete to construct. The Hoover Dam continues to play an essential role for the surrounding economies and their inhabitants, providing water to 8,000,000 people in Arizona, California, and Nevada. 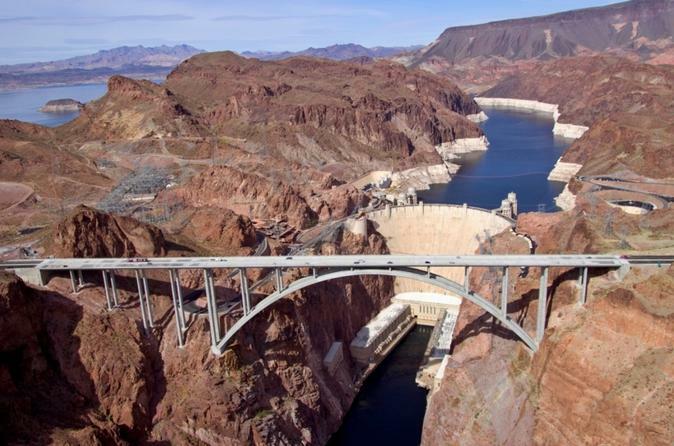 During this tour of the Hoover Dam, enjoy the best views from both the Arizona and Nevada sides of the Colorado River. The Mike O’Callaghan/Pat Tillman Memorial Bridge (also known as the Dam Bridge), now offers the highest accessible overlook of the Dam and Black Canyon. Included in this tour is a guided looked inside the visitors center, which includes live presentations, an amazing film about the history and construction of the Hoover Dam, the exhibit gallery, observation deck, as well as a walk across the massive crest. Stunning Lake Mead vistas and breathtaking views from the Memorial Bridge conclude our on-site exploration. Before returning to the hotel, another iconic photo opportunity awaits that is not to be missed! As one the most recognizable designs in history, nothing advertises the desert metropolis like the famous Googie style "Welcome to Fabulous Las Vegas" sign. Greeting car-bound travelers from the west coast since the late 1950s, this is your chance to have that one-of-a-kind picture taken right in front of Sin City's best known landmark. Round-trip transportation, entrance fees, snacks, and beverages are included. Special Offer - Save 24% when you travel on Monday, Wednesday, Thursday, Friday and Sunday or 9% on any other day of the week compared to the local suppliers price - Book Now!